Getting you ready for Cowboys baseball. STILLWATER — The final season of the Allie P. Reynolds Stadium era of Oklahoma State baseball starts Friday when the Cowboys travel to UT-Rio Grande Valley. The Cowboys are off a 31-26-1 2018 season that saw them finish second in the Big 12 regular season standings, but the Cowboys lost their opening two games in the Big 12 Tournament and were unsuccessful at making it out of their NCAA Regional. Already, 2019 looks off to a good start, as the Cowboys are healthy for the most part with starting pitchers Jensen Elliott and Mitchell Stone available after the two were injured for most of last season. Here’s a preseason look at the Cowboys’ 2019 season. Named to preseason All-American and All-Big 12 teams, Colin Simpson returns for his senior season with 31 career home runs and 100 RBIs. As a junior, Simpson led the Cowboys in home runs (18), RBIs (51), slugging percentage (.578) and walks drawn (37). He also proved quite durable, being one of only two OSU players to start all 58 of the Cowboys’ games in 2018. Although he wasn’t taken in last season’s MLB Draft, Simpson participated in the Cape Cod Baseball League this summer where he picked up some undrafted free agent offers, but he chose to turn those down to finish his OSU career. “I know that I don’t like school,” Simpson said. “I’ve never liked school, and I knew that if I were to leave here, there was no shot I would finish getting my degree. I think school is more important to me, and getting my degree is more important than a couple $100,000. That’ll only last you for so long, but the degree will get you jobs in the future and will last a lifetime. Jensen Elliott was named a Freshman All-American after the Cowboys’ College World Series run in 2016, but a Tommy John surgery kept him out for much of the 2017 and 2018 seasons. Now healthy, Elliott looks to improve on his 12-3 collegiate record and his 3.66 ERA. Apart from Simpson, Christian Funk is the Cowboys leading returner in on-base percentage, getting on in about 37 percent of his attempts in 2018. 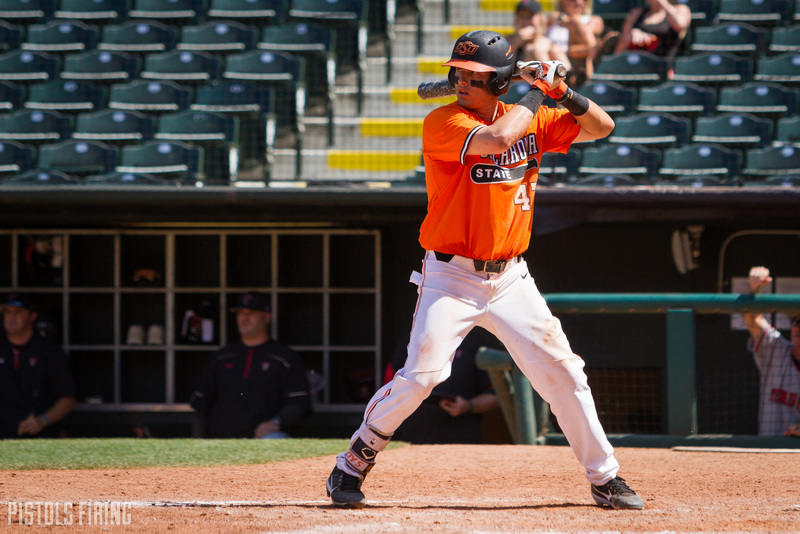 This year will be Funk’s second at OSU after transferring from Fresno City Community College. He started 53 games at first base in 2018, but depending on how things shake out, Funk could see more time at third this season. Funk was named to the NCAA DeLand Regional All-Tournament Team last season after batting .333 with a home run, two doubles and two RBIs in the Cowboys’ four regional games. As a sophomore at Connors State Junior College, Logan Gragg was 6-0 with a .206 ERA, and he had 56 strikeouts in only 48 innings. All of that came after a successful Tommy John surgery. At 6-foot-5, Gragg joins what is a tall rotation of starting pitchers for the Cowboys with 6-6 Jensen Elliott and 6-9 Mitchell Stone. From all accounts, Gragg is a Cowboy in more ways than one. He is majoring in livestock merchandise, and his dream job is to be a farmer. With vacancies peppered throughout the infield, true freshman Hueston Morrill could be the favorite to start opening day at shortstop. Morrill joins OSU from Suwannee High School in Live Oak, Florida. He is listed as both an infielder and a right-handed pitcher on OSU’s roster. A high school All-American, Morrill finished his time at Suwannee with a .291 batting average with 12 home runs, 44 RBIs and 25 stolen bases. On the mound, he finished with a 1.40 ERA with 153 strikeouts in 117 1/3 innings. Bryce Carter initially chose to leave his home state for Stanford out of high school. Carter graduated from Cascia Hall in Tulsa before heading to California. He started 20 games on the Cardinal’s Pac-12 Championship team last season. Carter’s addition to the roster should free up Simpson from having to grind out as many games from behind the plate, allowing him to play more in the outfield and as a designated hitter. Along with the four other Big 12 teams who popped up in most publications’ preseason rankings, the Cowboys also have some interesting nonconference games this season. The Cowboys are participating in the Dodgertown Classic with USC, UCLA and Michigan on March 8-10. OSU’s final game in Los Angeles, against Michigan, will be in Dodger Stadium. Most publications rank UCLA as a preseason Top 5 team, and Michigan is in most Top 25s. In it’s final year, Allie P. Reynolds Stadium with host the Bedlam nonconference game on March 26, with the Bedlam series coming May 10-12 with games from OneOK in Tulsa, Bricktown Ballpark in Oklahoma City and the finale in Norman. The week before the Bedlam series, the Cowboys will travel to Corvallis, Oregon, to take on defending national champ Oregon State in a three-game series. The Beavers start the year as a consensus Top 10 team. The week before that, the Cowboys play in Lubbock against Texas Tech, who the Big 12 coaches predicted to top the conference. The Red Raiders are in the preseason Top 5 of four of the five lists above. The Big 12 Baseball Championship returns to Oklahoma City May 22.